Bring out your humorous side with this incredible, warm sweatshirt. It is constructed from a thick, luxurious cotton blend fabric. 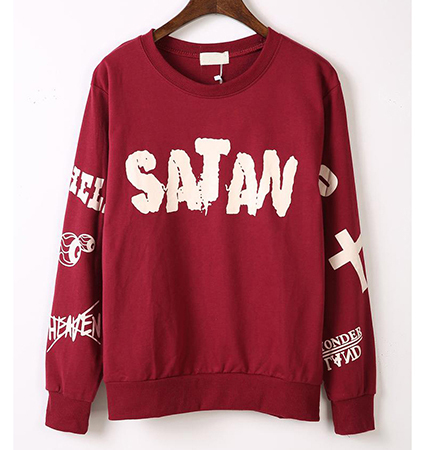 It is presented in your choices of red or black, and has the word, “Satan” written on the front in white lettering. Additional white lettering appears on the sleeves. The garment has a basic crew neckline and long sleeves. Knit ribbed trim appears at the cuffs and around the hemline. This garment may be washed in warm water and tumbled dry on a low heat setting. It is available for purchase in sizes Medium, Large, Extra Large and XXL.